There are many causes for a skin rash on legs. Some of the types of skin rashes which are likely to appear on the legs are discussed below. Diabetes can cause a rash type condition on the legs. Diabetes narrows the blood vessels in the legs and therefore there is reduced blood flow. Sores may develop, as well as various skin rashes, blistering, and often severe skin infections if the affected skin is not properly taken care of. Dermatitis/eczema is also a common cause for leg rashes. Atopic dermatitis generally is found behind the knees in adults and in the lower leg area for younger children. Discoid eczema often starts as a round patch on one leg and then many leg skin rash patches appear on both legs. The rash can spread to the rest of the body as well. For individuals with a varicose vein problem, varicose eczema can develop in the area of the bulging vein. Contact dermatitis can also occur on the legs. 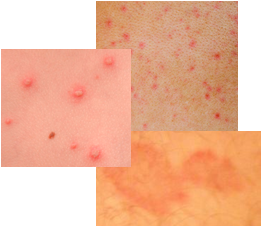 This type of skin rash is not necessarily specific to the legs but can occur anywhere on the body. Contact dermatitis is sensitively to chemical products leading to the development of a skin rash. A rash on legs can also be caused by other common skin problems such as psoriasis, ringworm, scabies, Graves Disease, and a fungal skin problem. Leg rashes are common in women, primarily due to hair removal. There are several hair removal methods and some can result in a rash. Waxing can irritate the skin and lead to a leg rash. However, there are two other hair removal methods that are more likely to cause a leg skin rash. The use of chemical products to remove hair can result in a chemical dermatitis skin reaction. Therefore, spot testing is a must when using these products in order to ensure there is no sensitivity to the product. Shaving is also a likely source of a rash on the legs. Removing hair on the legs with shaving and not producing a skin rash is an illusive goal for many. 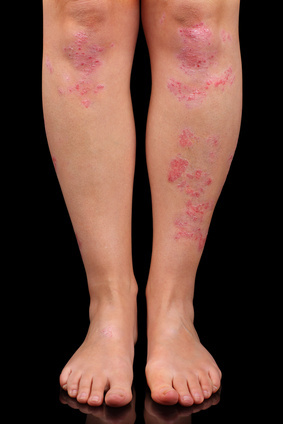 Experimentation with different shaving products and shaving techniques can lead to the reduction or elimination of this skin rash on the legs. Some of the possible causes of leg rashes have been briefly mentioned above. In reality there are a host of other causes for a skin rash in this area of the body. Additional skin rash information can be found here or at the diagnose my skin rash page.